Sadly, despite promising weather yesterday, I woke up today to rain. Well, to be exact, I woke up to one roommate puking his guts out (that, or he was giving birth to the anti-Christ), at 5 in the morning, and then lay awake in bed for a few hours until breakfast began. Everyone I’d spoken to yesterday had said that the breakfast buffet was the best they’d ever had in a hostel, so I was looking forward to having a heavy morning meal. Got to say they weren’t lying – you have cereal, fruit, rice, vegetables, salad, potatoes and bread. Most of it really wasn’t what I’d consider breakfast food, but there was one section that everyone loved. The omelette station. You could request fried eggs, scrambled eggs, or an omelette. Then about an hour later, the omelette station became a pancake station, which was even better. Best breakfast I’ve ever had while travelling by a mile. The weather was atrocious. When it stopped raining for about an hour, I risked going outside to see if I could get to the beach. Unfortunately, the map of Hoi An I had wasn’t to scale and I turned back after 40 minutes when there was no beach in sight. 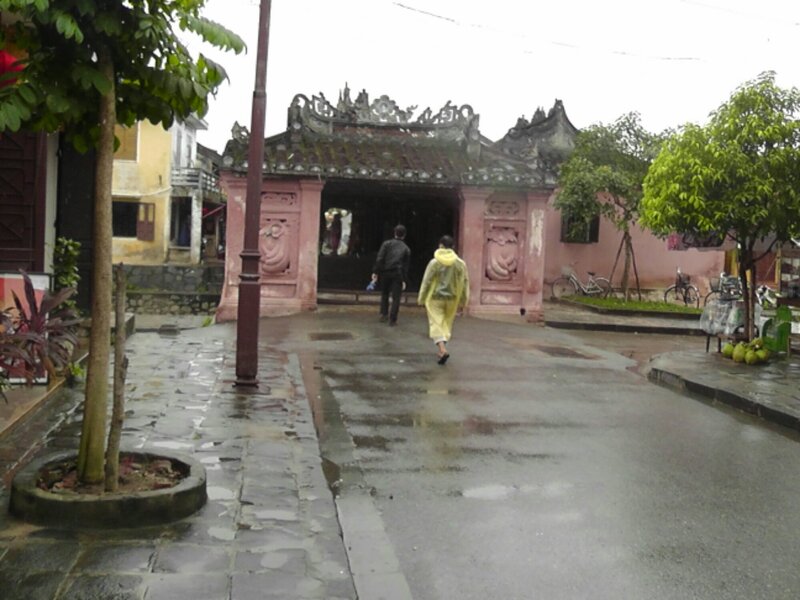 That said though, Hoi An is a very beautiful place to wander around. 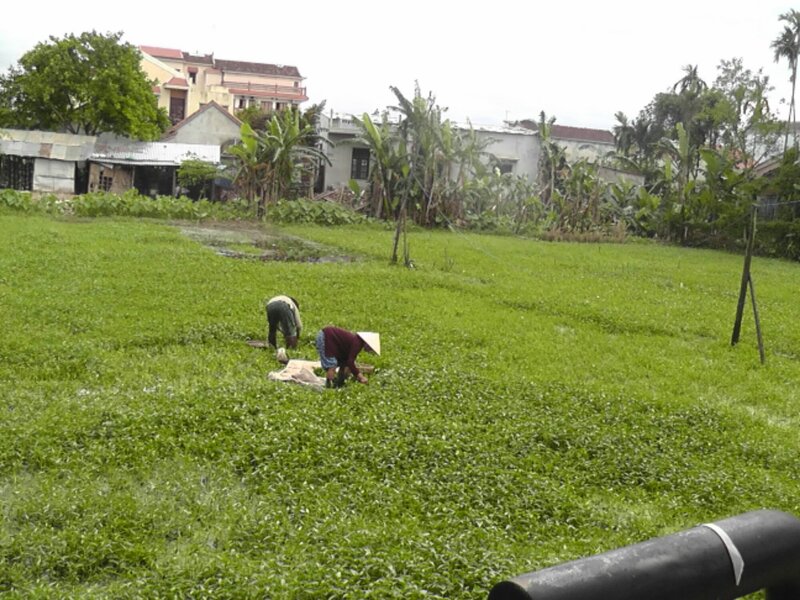 Its full of plants and rice fields, and the buildings are very unique. If it wasn’t for the threatening sky, I could have wandered around this city for quite some time. However, the rain hit and I fled back inside for a few hours. This at least gave me time to plan how I was getting to Danang for my connecting train. Hoi An is small so doesn’t have its own station, and Danang is a good 30 minutes away. Unfortunately that was going to be an expensive cab ride, so I was looking for cheap alternatives. Thankfully, while at the Sunflower, I caught the back end of a conversation – a group of people looking to get on the same train I am. After talking to them and finding out their plans, I bought a seat on the hostel minibus (which only goes out if they have several people going to the same place) for just over a quarter of the price of a cab. Talk with some other guests of the hostel until the rain recedes enough to risk going out, and head to the Old Quarter again. This place is as pretty in the day as it was at night – but ruined by the wet weather and general misery it generated. I ended up stepping in a puddle and soaking my foot, which didn’t endear me to the situation at all. As an added bonus, the Old Quarter is considered a tourist attraction, and they actually sell tickets to get into areas. There are actually areas of this neighbourhood you cannot walk through without a ticket. I avoided most of the buildings with a ticket booth as it was a really expensive place. 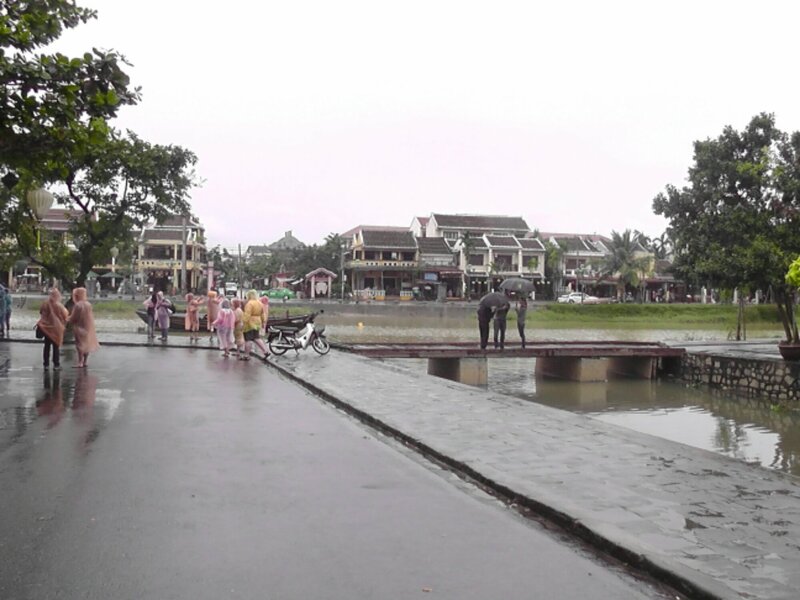 Hoi An has really become a tourist town. Returned to the hostel and swapped my wet shoes for my dry ones, and did more networking – helped a woman find a hostel in Dalat since she didn’t have a computer and the hostels ones were busy, and finally it was time for me to go and see my replicated jacket. Takes about 20 minutes to get to the store, and once I’m there I’m asked if I can come back at 16:30, because they were still working on the smaller details. So I’m back in the Old Quarter. Again. This time though I started looking for food since I hadn’t had lunch. Ended up picking a small place that had a well-priced menu, and had another Hoi An traditional food, Wonton Soup. Not bad – though prefer beef noodle soup – and then walked through the shopping parts of Old Quarter. I really want a Vietnam flag vest top in green, but it just doesn’t appear to exist. As an added bonus, I find the red flag as a strappy vest top, and it looks SO much better like that, but I’m not buying the same design in different styles. Go back, and have to wait another ten minutes until the jacket arrives. And got to say, despite my apprehensions about doing the tailor thing wrong, it actually looks really good. They’ve gotten all the frill detail, and the stitching on the pockets. And it fits perfectly – all that needs to be done now is fix the buttons, which is the only part they can’t replicate as the buttons are linen covered and large, so they have no options. Instead we have medium sized black buttons which works well with the red. Have to return at 18:00 to collect and pay for it, which I do, and head on back to prepare for the 20:00 bus. However, when I get it out of the bag to show to a few people, I spot a glaring error I hadn’t in the shop. The pockets have double stiching – mostly for decoration – and the upper left side pocket is missing the stitching! I call the number on the card I received from the store, but got a woman who didn’t seem to understand. Despite that, she came to the hotel to see. Turned out she was from the store next door who uses the same number. She took the jacket back, promising it would be fixed in half an hour, and took off, leaving me watching the clock in worry. Thankfully, its a non-issue. At 19:15 the woman I had been dealing with up until that point came rushing through the door with the amended jacket. Said her boss got her in quite a bit of trouble for that oversight, but I’m just glad to have the jacket in finished condition. Finally, its time to leave Sunflower – and we all clamber into the back of the bus. The larger group I’ve sort of joined has a huge teary goodbye to a collection of other people – they’ve been here a while and bonded with a lot of people – and we hit the road for Danang. Takes about 40 minutes, and we trundle into the train station to wait for the train. Vietnam trains are cheap, but they are nowhere near accurate when it comes to time. As such, ours is a good 30 minutes late, and a packed train station tries to clamber on. The group booked last minute so is in the cheap sleeper seats, while I’m in the soft sleeper carriage next to it. No doubt I’ll see them in the morning when we try and blag a taxi. This entry was posted in Diary, Vietnam and tagged Hoi An, Night Train, Old Quarter, Sunflower Hotel, Tuong Clothes Shop, Vietnam. Bookmark the permalink.